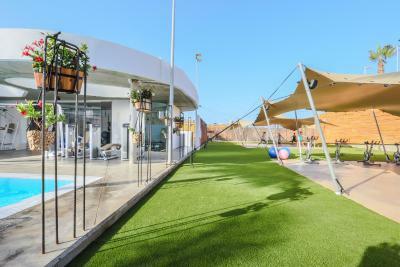 Lock in a great price for Hotel Baobab Suites – rated 9.1 by recent guests! Delightful breakfast at our own terrace with an amazing view. Location is beautiful and suites are perfect. Food in all restaurants is of high quality. Very nice hotel. They have a big kids room which is a dreamworld for the kids. Also they have sand in the garden so the kids can play there as well. Gym is excellent for a hotel gym. Nice view and not a busy location. We absolutely loved this hotel. The staff were so helpful and friendly, the breakfasts were amazing and the accommodation really well equipped and very very comfortable. Super rooms, spacious and clean. Very good and friendly staff and the yacht trip on Papillon was fantastic. A beautifully designed hotel. Spotlessly clean. Lovely swimming pools. Great breakfasts. Great services. Kids loved the place. Very kind and helpful staff. Magnificent rooms. Wide sat channels offer. Free practical parking. Generous breakfast. Fabulous rooms suites. We really enjoyed our stay here. The staff are very friendly. The facilities superb for an apartment stay . The breakfast boxes are great idea really good. Well done . We will be back. I made reservation with private pool. I pre-searched review and got room info that it's private but opened view by others. 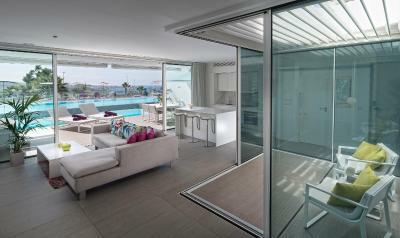 It's transparent partition and everybody can see our private pool. So I really worried and wanted to change another room. but I didn't. It was great decision and extremely satisfied. Hotel Baobab Suites This rating is a reflection of how the property compares to the industry standard when it comes to price, facilities and services available. It's based on a self-evaluation by the property. Use this rating to help choose your stay! One of our best sellers in Adeje! Set 10 minutes’ walk from Duque Beach in a residential area of Costa Adeje, Hotel Baobab Suites offers an outdoor pool and sun terrace. 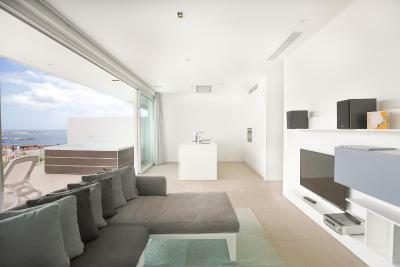 Its spacious, air-conditioned suites have furnished terraces. Featuring a white, modern décor and large windows, each bright suite includes a living-dining area with a flat-screen TV. Their kitchen areas include an oven, microwave, dishwasher and washing machine. Free WiFi is available throughout. Guests can enjoy a welcome package consisting in a bottle of wine and water. 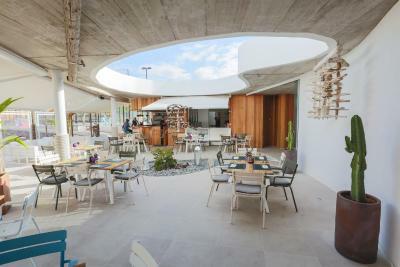 There is also a an on-site restaurant, the Bite Buffet, which offers a wide variety of dishes from international cuisine, including Canary, Spanish, Italian, and Asian. The center of Costa Adeje is a 15-minute walk from Hotel Baobab Suites and offers a selection of restaurants, bars and shops. 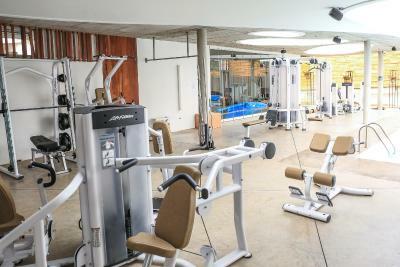 Sports and activities such as spinning, pilates and beach volleyball are organized at the on-site Activate sports and leisure center, also offering paddle tennis courts and boules. 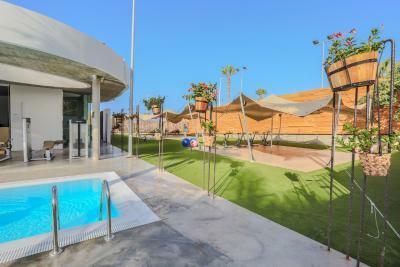 When would you like to stay at Hotel Baobab Suites? Offering access to the shared pool and sun terrace, Boutique XS is a bright studio with chic contemporary décor and a well-equipped kitchen area. Guests can enjoy a welcome package consisting in a bottle of wine and water. Boutique XS is fully adapted for guests with reduced mobility. Featuring a spacious private terrace, with an outdoor dining area, Boutique Edén is a bright 1-bedroom suite with a modern living room and well-equipped kitchen.Guests can enjoy a welcome package consisting in a bottle of wine and water. Suites for guests with reduced mobility are available. Offering side views of Costa Adeje and the Atlantic Ocean, Boutique Suite is a 1-bedroom suite with a spacious private terrace and outdoor dining area. It features a double bedroom and well-equipped kitchen with a dishwasher. Guests can enjoy a welcome package consisting in a bottle of wine and water. Offering a stylish terrace with a hot tub, Boutique Lago is a luxurious 1-bedroom suite. It features side ocean views, as well as a chic living room and a well-equipped kitchen area with a dishwasher. Guests can enjoy a welcome package consisting in a bottle of wine and water. Featuring a private pool and hot tub on its terrace, Boutique Mar is a 1-bedroom suite with side views of the Atlantic Ocean. There is a bright living room with a corner sofa and a well-equipped kitchen area with a breakfast bar. Guests can enjoy a welcome package consisting in a bottle of wine and water. Overlooking the ocean, this luxury loft offers impressive views from its private terrace, as well as a hot tub. This open-plan space has a sleeping area with a double bed, opening onto the terrace, and a well-equipped kitchen with a dishwasher and oven. Guests can enjoy a welcome package consisting in a bottle of wine and water. Offering a spacious private terrace, with side views of the Atlantic Ocean and Costa Adeje, Serenity Suite is a 2-bedroom suite with bright stylish interiors and a well-equipped kitchen. Guests can enjoy a welcome package consisting in a bottle of wine and water. Featuring a hot tub on its private terrace, Serenity Lago is a stylish 2-bedroom suite with side ocean views. There is a well-equipped kitchen and spacious living room. Guests can enjoy a welcome package consisting in a bottle of wine and water. Featuring impressive Atlantic Ocean views, this spacious and luxury suite comes with a large private terrace. This spacious suite has an outdoor chill-out area and a bright living room with space for dining.Guests can enjoy a welcome package consisting in a bottle of wine and water. Offering a hot tub on its private terrace, this spacious and luxury 2-bedroom suite has stylish minimalist décor. 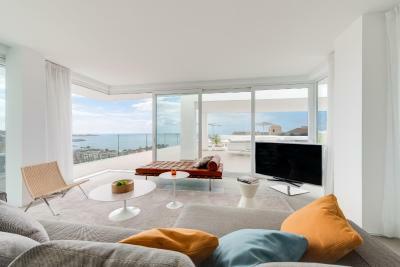 The living room opens onto the terrace, with chill-out area and sun loungers, and features chic contemporary furniture. Both bright bedrooms have direct access to the terrace. Guests can enjoy a welcome package consisting in a bottle of wine and water. Featuring a private pool on its terrace, Serenity Rio is a stylish 2-bedroom suite with side ocean views. This bright modern space includes a well-equipped kitchen with a breakfast bar, as well as a living area with corner sofa. 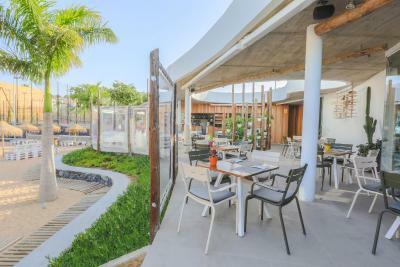 Sun loungers and an outdoor dining area can also be found on the terrace. Guests can enjoy a welcome package consisting in a bottle of wine and water. Featuring a private hot tub and 1 swimming pool, Serenity Mar is a chic 2-bedroom suite with an outdoor dining area and stylish chill-out zone. Inside there is a bright open-plan kitchen and living room. Guests can enjoy a welcome package consisting in a bottle of wine and water. Offering a terrace with private pool and views of the Atlantic, this luxurious and smart 2-bedroom suite features a well-equipped kitchen and chic décor. Guests can enjoy a welcome package consisting in a bottle of wine and water. 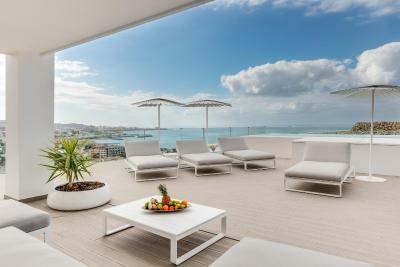 Offering side ocean views from its private swimming pool and terrace, Vitality Rio is a 3-bedroom suite with chic white décor and stylish furniture. There is a well-equipped kitchen, dining area and bright living room with corner sofa. Guests can enjoy a welcome package consisting in a bottle of wine and water. Featuring a private terrace with swimming pool and hot tub, overlooking the Atlantic Ocean, Indulgence is a stylish 3-bedroom suite. It includes a well-equipped kitchen and a corner living room with impressive views. Guests can enjoy a welcome package consisting in a bottle of wine and water. Offering a large private terrace with swimming pool and hot tub, Euphoria is a spacious 4-bedroom suite with impressive ocean views. 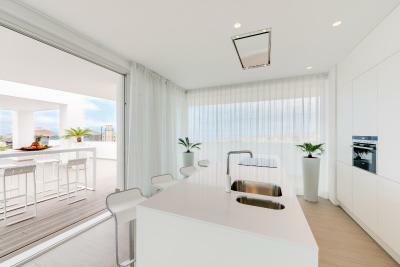 This bright and stylish space includes a well-equipped kitchen and a chic living area, opening onto the terrace. Guests can enjoy a welcome package consisting in a bottle of wine and water. This spacious 3-bedroom Vitality Mar Suite features a large terrace with a private pool, hot tub, and side views of the ocean. It has a kitchen equipped with a fridge, dishwasher, and hob, and the private bathroom comes with a rain shower, hairdryer, and bathrobes. It also comes with a washer/dryer, ironing facilities, and safe. Guests can enjoy a welcome package consisting in a bottle of wine and water. The spacious and luxury 3-bedroom Harmony Suite has a kitchen equipped with a fridge, dishwasher, and hob, and the private bathroom comes with a rain shower, hairdryer, and bathrobes. It also comes with a washer/dryer, ironing facilities, and safe. It also features a large terrace with a private pool, hot tub, and side views of the ocean. Guests can enjoy a welcome package consisting in a bottle of wine and water. Serenity Pico is a stylish 2-bedroom suite featuring a large terrace with views of the mountains. There is a kitchen equipped with a fridge, dishwasher and hob, a living room with a flat-screen satellite TV, and a private bathroom with a bath or a rain shower, hairdryer, and bathrobes. A safe, washer-dryer and iron are available. Guests can enjoy a welcome package consisting in a bottle of wine and water. Boutique Rio features a private pool with side ocean views. This modern suite has a furnished terrace, a fully equipped kitchen and a seating area with a flat-screen TV with satellite channels. The bathroom comes with a bath and a rain shower and a hairdryer. Guests can enjoy a welcome package consisting in a bottle of wine and water. This luxurious suite features a private pool and a large terrace with sea views. It includes a bathroom, large dressing room and a spacious living area. There is also a fully equipped kitchen. Guests can enjoy a welcome package consisting in a bottle of wine and water.